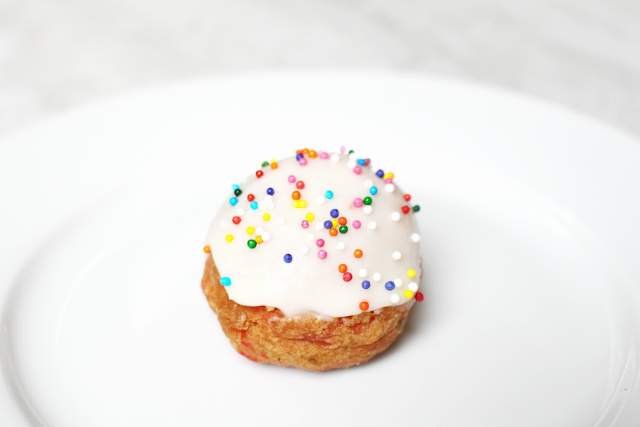 In honor of my blog’s 3rd birthday the other day, I thought it fitting to celebrate! Naturally I needed a dessert in order to properly do so, so I made donuts for the first time! 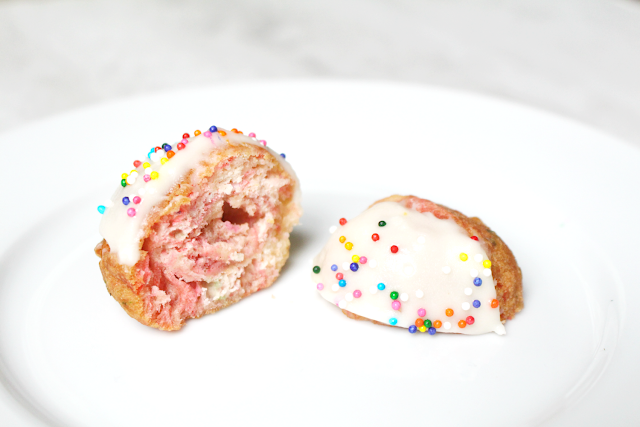 Stepping away from the traditional kind, I chose to make birthday cake flavored donut holes. To jazz them up I also added food coloring to marble the batter and sprinkles to make them more birthday appropriate. All in all, this recipe is not too shabby and these lil donut bites were rather addicting despite them being my first batch ever! 2. Set aside in refrigerator. 1. In a stand mixer bowl, whisk together flour, sugar, baking powder, and salt. 2. Beating the ingredients at low-medium speed, combine the butter with the dry ingredients. Add the eggs, vanilla, milk, and food coloring/sprinkles. Continue to beat until combined fully and smooth. 3. Fill a medium pot with about 2 inches of oil. On the stove, bring the oil to medium heat. 4. Line a baking sheet with parchment paper and roll out the dough into 1/2-1 inch in diameter dough balls. 5. Using a spoon, place a few balls into the oil. Turn every minute until golden brown all around. 6. Place the donut holes on a paper towel covered sheet or plate. Let cool completely. 7. Frost and decorate! Store in the refrigerator. Happy bloggy anniversary <3 And congrats! Thank you so much for sharing this. I pinned it ;) I can't wait to make these. this looks SO yum! Congrats on 3 years of blogging! I hope you continue being great and doing this for the many years still ahead! Those are so cute and yummy looking! Happy blogging anniversary! What for beautiful birthday donut sweets! I'm a little bit late but also a happy bloggersary afterwards from me! I would like to eat some of these donuts, they would be the sky for me.